The developers of Bioshock Infinite game have promised to reveal new secrets of their upcoming project in new interesting videos, and the next Bioshock Infinite trailer was really released a day ago. This very special video tells us more about beautiful flying city Columbia - the setting of Bioshock Infinite game. 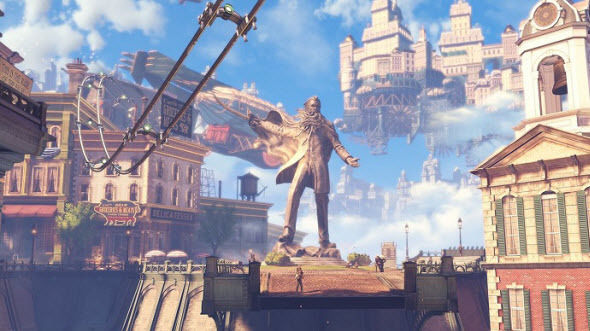 It is interesting that new Bioshock Infinite trailer looks like documentary, that in very exciting form reveals new details about Columbia, but also puts new questions about the game's story. We'd like to show you new Bioshock Infinite trailer and we hope to see your opinion about it in the comments below. Also visit our Facebook community to find more interesting videos and news from the gaming world. Get Bioshock, Borderlands 2, Civilization IV and more projects at Green Man Gaming for pleasant prices!